he is considered today an ambassador of the Latin American poetry and music culture and one of the finest soloist composer-performers of the land. His musical influences stem from Joropo which combines poetry, with Classical, Flamenco and Jazz. He sings and plays the Modelo Corvado harps, the Cuatro and the Maracas with great skill. Established in England since 1979, he has shared the stage with different accomplished performers from around the world. His reserved personality illustrates the characteristics of the real Llanero who knows well the roots and values of his culture. Ricardo has recorded 4 singles and 4 very distinctive albums, his latest being Espíritu Llanero / A Londres (Llanero Spirit / To London), a varied recording of poetry works with themes for all occasions. His most recent tour to the North of England and Scotland was part of the launch of this new album. THE HOMO SAPIENS DREAM, title track of his previous album, brings Latin America’s music and poetry to a new dimension. This dramatic poetical-progressive interpretation of human evolution has been much acclaimed by audiences. Thanks to this piece, Ricardo was presented as the perfect act for the day at the London Natural History Museum, during the Exhibition Road Festival in 2010. Ricardo studied the harp at the Music Academy of Villavicencio, with Luis Alberto Curvelo, his brother and Director of the institution. Ricardo later became Director of Dance for 3 years at this academy. The two brothers founded The Music Academy of Puerto Carreño (Vichada) and Ricardo lead the first music cultural representation of the region, which was awarded first prizes internationally. He went on to study music theory at the Music Academy Luis A. Calbo and attended voice production classes with legendary maestro cultural promoter, Manuel Zapata Olivella, at the National University in Bogotá. As a young artist Ricardo shared stage performances with international stars such as Julio Iglesias, at La Media Torta (Bogotá). He toured extensively throughout Colombia and Venezuela, after being selected by Polimeros Colombianos as one of the National leading representatives of the Llanos as a poet and a dancer. He has also toured to Brazil, Mexico and North Africa. The special talent that Ricardo showed early as an artist on stage before the maestro representatives of Llanero music (Joropo), led him to be the youngest dancer and composer/poet/performer to be awarded International first prizes on several occasions. He is a winner of six international competitions in his home land, three as poetry writer and performer and three as a dancer. Here in Europe, his dedication as a unique artist and restless desire to contribute and to open new horizons for his culture, led him to construct a new Latin American harp, the Modelo Corvado, and with this instrument, the development and presentation of a unique new wave of poetic music. In 1990 he introduced on British Television his first version of this instrument, and in January 2000 he completed and gave his first concert in London with his new design. 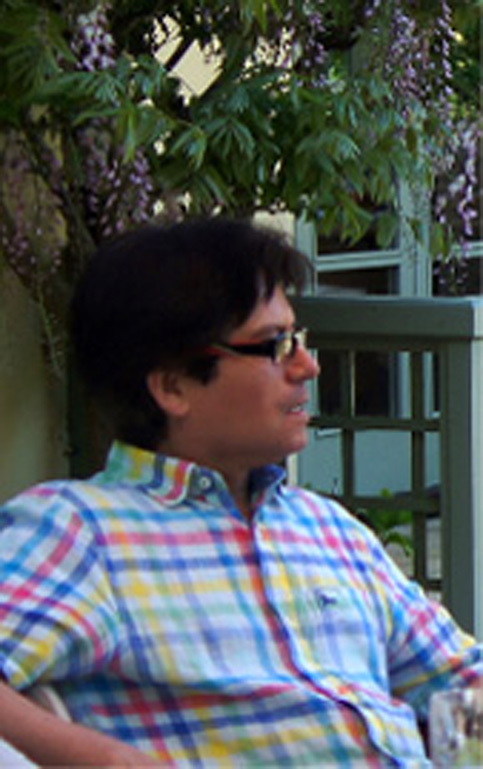 As a poet, Ricardo is today artistically known as El Cóndor. He is author of numerous compositions, exceeding 500 hundred works of instrumental music, songs and poetry, books, and plays. Several of his works have been recorded by him and by different artists. His most well-known titles include: LA VERDAD DESNUDA (The Naked Truth), COLOMBIA PARA TI (Colombia For You), LA VERDAD DESCUBIERTA (The Discovered Truth), EL QUE MANDA ES EL BILLETE, (Money Is What Governs), CARTA A MI PUEBLO (Letter To My Town), EL IRRACIONAL (The Irrational), THE FAREWELL POEM, THE ORINOCO DOLPHIN, THE BALLERINA and his music poetical-progressive composition, THE HOMO SAPIENS DREAM. Ricardo lives in England. He married Sharon Elizabeth Peters. They had met previously in Colombia and lived together in Bogotá. It was to Sharon that he wrote one of today's most loved poems of his country, Colombia Para Ti. From their marriage they have a son, Alex. Ricardo continued studies of voice production and music composition at the City Literary Institute in London. He studied also English as a Second Language and Spanish Literature at the Polytechnic of Central London. In 1987 Ricardo formed the group MATIZ. He has given performances in a great number of halls, theatres and educational institutions and has represented Latin America both as soloist, and as leader of MATIZ throughout the UK in different musical events, such as the Edinburgh International Festival; Cardiff World Harp Festival, Pontardawe Festival, Music for Clarinbridge (Ireland), Art in Action Oxfordshire (England); (FITA) Festival of International Theatre and Arts London; O' Carolan Harp Festival (Ireland); Festival, The National Eisteddfod Of Wales (Wales); Woodford Festival (England); Colombiage Cultural Festival 2010 London. He has recorded live performances for BBC Radio and TV, and Satellite BSB TV. Ricardo has given several benefit performances in England, the most recent being a concert in aid of Cancer Research at Epping Hall, Epping. Charity concert for St Catherine’s Church, Ventnor (Isle of Wight); CONCERT FOR JAPAN, charitable Concert to raise awareness and funds for the victims of the earthquake and tsunami catastrophe in Japan in April 2011.. a video documentary, From the Cradle to The Universe, released by Theatro Technis Charity (London); a concert in aid of Children of the Andes at St James Church, Piccadilly (London). Over the past few years he was one of the favourite performers in Art in Action in Oxfordshire. More recently, his series of Seasonal solo concerts, Rhythms From Latin America, have expanded to different regions of the UK where they have been well received. Joined by classical guitarist Adrian Azuelo, the last London winter concerts , crafted by these two fine soloists, embraced the Spanish and Latin American music culture widely, with two very much appreciated performances. A most enjoyable evening. Beautiful classical & original harp music. S. C.
A wonderful introduction into a completed different expression of harp music beautifully expressed. Than you. Susie. Very atmospheric /mesmerising…great range of emotions evoked – thank you! The Homo sapiens piece reminded me (in places!) of Pink Floyd. Stan L.
Possibilities are arising for future performances abroad. He has been invited to travel to Colombia, to Los Llanos to pick up an award which he would be honored to receive next time he visits the country. Contact ( ( ( ( (((( E )))) ) ) ) ) Mail.